Some people don't want to sacrifice their vision when it comes to wearing contact lenses. Others are willing to give up having excellent visual acuity if it means that they can find a contact lens that is comfortable to wear. 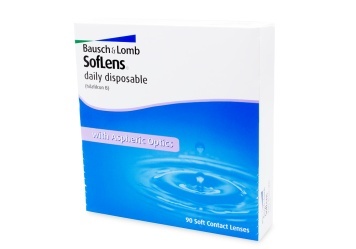 Luckily, there are Soflens Daily Disposables that can offer people the best of both worlds.The reason that these lenses are so easy to wear is that they come with the ComfortMoist design that has been developed by Bausch & Lomb. Not only does it mean that the lenses have the ability to release moisture throughout the day, but they are also thin so they are extremely comfortable. Along with the moisture, the thin design and the hilafilcon B material that is used to them allow more oxygen to get to the eye. This will reduce the possibility of redness and irritation from lack of oxygen.